He was straight of stature, succinct of speech, and as well-versed in nature as he was in the old days when Hollywood was not yet a dream and Los Angeles was a dusty pueblo. 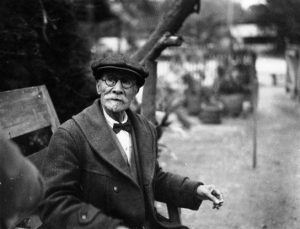 Eugene Rafael Plummer, the man for whom Plummer Park in West Hollywood was named, was born in San Francisco on January 8, 1852. His father, John Cornelius Plummer was a Canadian sea captain and his mother, Maria, was half Spanish and half Irish, a mixture which gave the younger Plummer the fire and romance of old Spain and the devil-may-care temperament of the Irish. When Eugene was 16, Captain Plummer moved his family to Los Angeles where he homesteaded 160 acres of land where the Ambassador Hotel stood. He later acquired property which is now bounded by Wilshire and Beverly Boulevards, and La Brea Avenue and Vine Street. In 1828, the land that now encompasses Plummer Park was a part of the 4,439 acre Rancho La Brea, granted by Governor Echandia to Antonio Rocha. After several selling’s, the property was sold to Major Hancock in 1865 for $2.50 an acre. In 1874, Plummer acquired the official title to the Plummer Rancho comprising 160-acres between Sunset and Santa Monica Boulevards and La Brea and Gardner Avenues. That same year, on the three acres of land that eventually became Plummer Park, Captain Plummer’s sons, Juan (John) and Eugene built their home, a typical ranch house. In the early days Plummer’s home was the only habitation from Hollywood to the Plaza district and rattlesnakes, cactus and bandits were his only companions. Later, his home was the headquarters for the Vaquero Club, a group of adventurous horse riders. 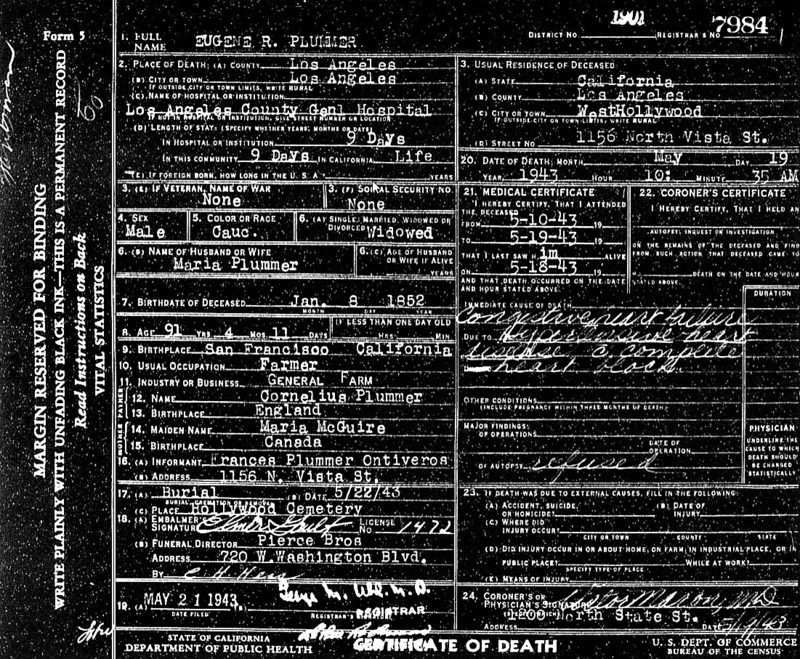 In 1881, Plummer married Maria Amparo La Moraux and the couple had a daughter that they named Frances. As a court reporter for 25 years, she would befriend the pueblo’s Mexicans and act as their interpreter in court cases. As early as 1922, the acreage was unofficially called Plummer Park. Six years later, options were offered by a committee of prominent bankers and businessmen to make it official. Plummer hoped to make around $25,000 from the deal but nothing ever came of it. In 1925, his wife Maria died and was interred at Hollywood Cemetery next to his father John. By this time, Eugene Plummer was Hollywood’s oldest resident, and his homestead became its oldest residence. Each year, he would host the old-timers picnic which was open to as many of Hollywood’s original residents that were still living. Gradually, Plummer’s debts continued to mount until he was forced into foreclosure. Ironically, Plummer once owned 142 acres where the Hollywood Bowl now is and sold it to a company named Burnoff & Teal for $2,400. In the 1930s, that same area was worth millions. 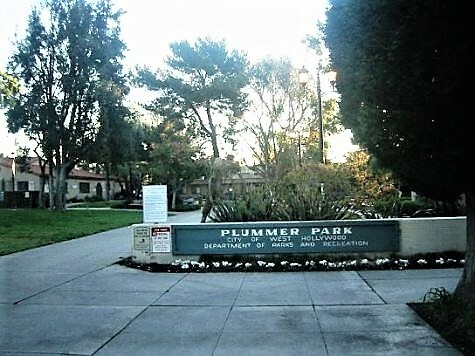 In 1935, Plummer Park was registered as a landmark. Finally, the county stepped in and acquired the Plummer land in 1937 for $15,000. Plummer was sad at the passing of his heritage, but never bitter. Development of the park began the following year with the construction of a recreation building called the Great Hall/Long Hall at a cost of $65,000. The Spanish style structure, made of stucco and a red tile roof, included a dining room seating 300 persons. The building also had a library and reading room. The patio, adjacent to the kitchen, would seat 600 and was shaded by three ancient olive trees. One condition of the purchase was that Senor Plummer be permitted to occupy the premises as long as he lived. The county designated him as the historical guide for the park. Plummer Park was filled with a fine collection of rare trees and plants. One pepper tree had a branch growing out horizontally over seventy-five feet in length. The limb was trained by Plummer by keeping a horseshoe on the end of it for many years. The old frame home built by Plummer and his brother in 1874, was now used as the headquarters of the Audubon Society, and the office of the park superintendent. A modern home adjacent to the parks property became Plummer’s new home where he lived for the remainder of his life. 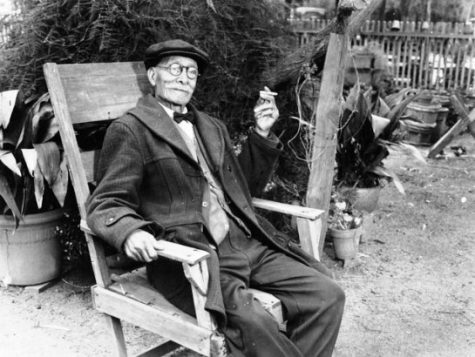 In his later years Senor Plummer would sit beneath the shady pepper trees of Plummer Park, rolling cigarettes from loose tobacco, or break store-bought cigarettes into three lengths and smoke them a few puffs at a time in an old amber holder. Between puffs, he would conjure up memories of the “good old days” for anyone who asked. Pepper trees were his favorites. “They kept the flies away,” he maintained. There was the time he chased a deer all the way up to what is now the corner of Hollywood and Highland and lassoed it. Nearby, in a little arroyo, he killed a giant brown bear after it had been gored in three places by a wild bull. Once, in Laurel Canyon, he shot an antelope on the hillside but couldn’t find the bullet hole. “You scare him to death, senor,” said the old Indian who was with him. But it was later found that the bullet went right up the spine and lodged in the antelope’s brain. “Once in a million times,” said the Don concisely. 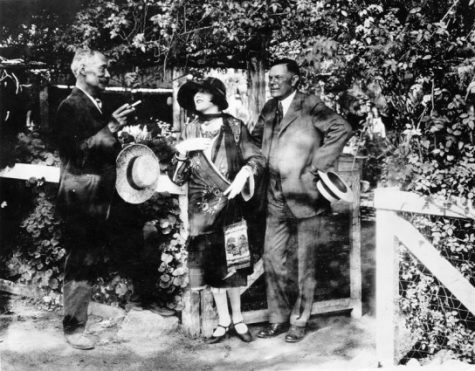 Senor Plummer welcomes actress Ruth Roland and banker G. G. Greenwood to Plummer Park. Plummer delighted in wearing a tan leather jacket given to him by his friend Buffalo Bill. Another of his friends in the early days was the bandit Tiburcio Vasquez, who was shot by authorities in 1875. Plummer’s presence at the park gave it an air that no other presence could. The plan was to keep the park in its original state for a unique gathering place for groups and societies. Barbecues and songfests under the old peppers and the eucalyptus trees were planned as the whirl of Hollywood traffic sped by. Visitors were sheltered by the towering blue gums, the gnarled old olives and the gigantic cypress that Plummer planted with his own hand in the late 1800s. Besides the old ranch house, the servant’s houses, the old barns, the barbecue pit, the old windmill, and the rodeo grounds, it became a chapter of the past brought into the present for the public. Year after year Senor Plummer continued to enthrall and entertain the visitors to his park. To the last his mind and memory remained keen and filled with humorous memories. Then, one day, the Don suffered a heart attack in his home at Plummer Park. He wanted to remain at his hacienda with his collections of saddles, boots and guns, but friends convinced him to go to the hospital where he sank into a coma from which he never recovered. Senor Eugene Plummer died on May 19, 1943. He was 91 years old. Rosary for Eugene Plummer was recited in the chapel of Pierce Bros. Hollywood Mortuary. Mass was celebrated the following day at St. Ambrose’s Church at Fountain and Fairfax Avenues. More than 300 persons, most of them descendants of some of California’s oldest families, attended the rites. 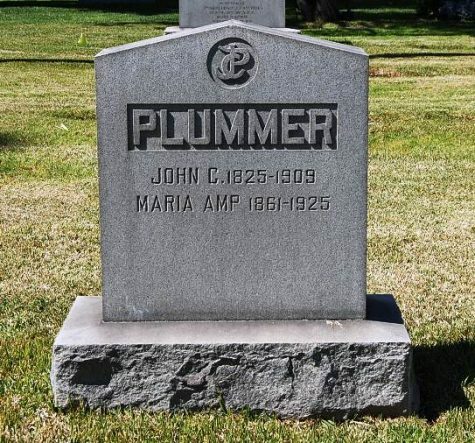 Plummer was interred next to his father and wife at Hollywood Cemetery. 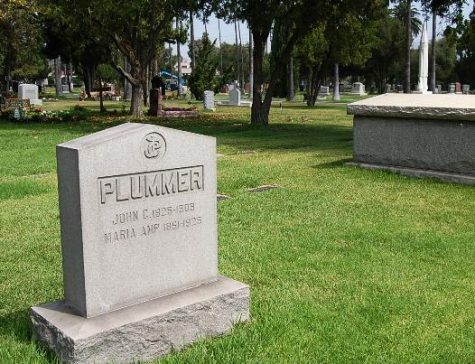 The Plummer Family marker at Hollywood Forever Cemetery. The names of Plummers’ father and Eugene’s wife Maria are engraved. For whatever reason, Senor Plummer was never marked. The Eugene Plummer family plot at Hollywood Forever Cemetery. As for the Plummer House, it was known as the “Oldest House in Hollywood” and was designated as State Historical Landmark No. 160 in 1935. The Audubon Society continued to use Plummer’s old homestead to house their library and exhibits until 1980. Sadly, vandals set fire to it twice, and ruined the Audubon’s library and exhibits. The house was almost destroyed and stood abandoned and filled with trash for over two years. It was almost razed. 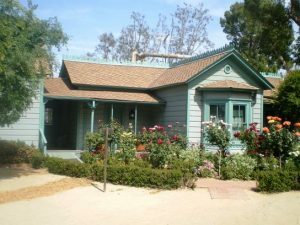 Happily, the Leonis Adobe Association heard about the house’s fate and arranged with the county to move the front part to the Leonis Adobe grounds. The house has since been repaired and restored, and is now a Visitor’s Center and Gift Shop. 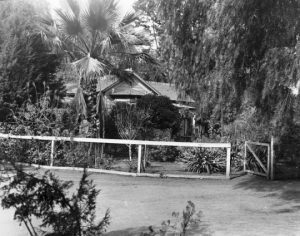 The old house that Plummer and his brother built was moved to Leonis Adobe grounds in Calabasas. Plummer Park was once again in the news for the drastic changes that the city of West Hollywood planned. If you asked visitors to Plummer Park, or members of West Hollywood’s city council, who Eugene Plummer was, they probably wouldn’t know. Virtually nothing remains of the park that Don Plummer knew and loved, and sadly, there is only one plaque that mentions him. Hopefully, that will be corrected. When in Los Angeles, visit Plummer Park at 7377 Santa Monica Blvd. in West Hollywood.